The 12 days of Christmas are filled with joyous gift giving. When it comes to your finances, however, there’s nothing wrong with keeping more and spending less. Now’s a good time to review your financials. Include your investment portfolio, your financial goals — even review your tax status to help improve your financial state! So, forget about buying five golden rings, four calling birds and three French hens. Hold onto more of your money with these year-end financial tips. If you have some losses in your portfolio, it might be a good time to sell those stocks to offset any gains you may have from stocks you sold for a profit earlier in the year. For 2017, you can write off up to $3,000 in capital losses against capital gains on your income tax return. A capital gain is the profit you make when you sell an investment such as a stock. That profit is taxable. So, if you’re able to claim some or all that investment loss, you may still gain in the long run. If you have more than $3,000 in losses that cannot not be used to offset gains, you can carry the excess forward to next year, too. In a recent LGFCU Facebook poll, respondents said organizing tax files is a very important step in closing out the year. Doing so makes sense. Finding the right deductions to itemize can mean a lower tax bill and more money in your wallet. Go ahead, gather up your receipts and start adding up your deductions! Another way to reduce your tax bill is by making an extra mortgage payment before the end of the year. This may net you a greater tax deduction this year. You may also be able to reduce the term of the loan and total interest paid — especially if you do this every year. Give those 10 lords something to leap for and donate to your favorite charity. Giving becomes a win-win for you and the charity. Make your donation with a credit card by December 31 and you’ll get the deduction this year — even though you may not pay for it until next year. Plus, you’ll feel good knowing you’ve supported a good cause. Get a jump start on saving on next year’s tax bill, too, by increasing the amount of money deducted from your paycheck. Ask your Human Resources department for a new W-4 form. Then review it and make changes as necessary. Did your goose lay a golden egg this year? Maximize your retirement account with any extra you’ve received from a salary increase this year. Check with your Human Resources department to see if you can increase your 401(k) contributions in the last few weeks of the year. Consider funding your retirement account to the maximum limit — $18,000 for 2017. If you’re 50 or older, you can add an extra $6,000 as a catch-up contribution. The extra contribution helps reduce the amount of your taxable income. There’s nothing worse than paying for 11 pipers piping at the end of the month when only two were budgeted. As if that wasn’t bad enough, you could still pay the piper hefty interest charges the following year. Save on interest charges now with a balance transfer to LGFCU’s low-interest Visa® Credit Card. Going forward, don’t carry a revolving balance and only buy what you can pay off every month. This helps avoid debt and ensures you will not overpay for the item in the long run. Create financial goals for next year and give the 12 drummers something to drum about. Ask yourself, ‘How much do I want to save? What big-budget items do I want to buy? How will I pay for them?’ Commit your answers to paper, share with a friend or add them to an app on your phone as a constant reminder. Achieving certain financial goals may not be difficult, but it may require changes in lifestyle and spending habits to reach them. Let LGFCU help get you where you want to be with Compass, our money management service. Track and manage your spending with Compass. Gather information from all your accounts, then view all your transactions in one place. You can set goals and track your progress. The best part is you can download the app and keep track on the go, or log in from your desktop. Check with your service provider, since data fees may apply if you’re not using Wi-Fi. Between a personal finance manager or a trusted person in your life, you’ll have no trouble staying focused on improving your finances for the new year! 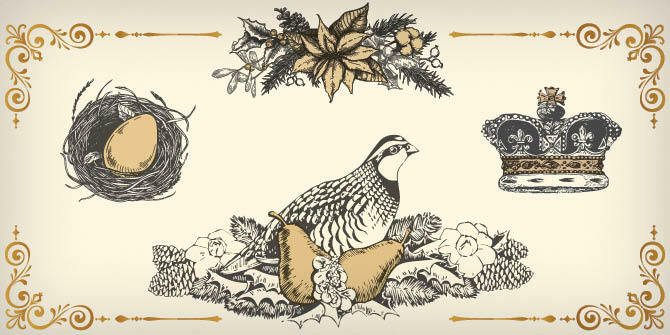 Who needs a partridge in a pear tree, anyway? Editor’s Note: The “12 Days of Christmas” has many variations on each verse. LGFCU hopes you enjoy this version. The advice provided is for informational purposes only. Contact a financial advisor or tax advisor for additional guidance. Make room for mom or dad!